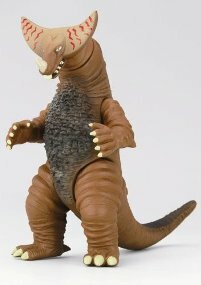 One of Ultraman‘s classic foes, the monster Gomora, is getting a new lease on life. Not only will he be starring in Tsuburaya Productions upcoming movie, “Mega Monster Battle: Ultra Galaxy Legend,” he’s also getting a new look in the form of this spectacular costume. It’s 10 feet (3 meters) tall, 20 feet (6 meters) long, has flashing eyes, breathes smoke, and can even roar. Best of all, it’s all controlled by one guy, who moves the legs and arms while wearing the suit over his body! This isn’t the costume from the movie. Nope, this suit isn’t meant to stomp on model buildings. This is a costume. Like the kind of costume you could wear to a Halloween party! It’s from Tsuburaya’s upcoming “Dekaiju” line of animatronic monster costumes. Sure makes my Balloon Boy costume look like crap!